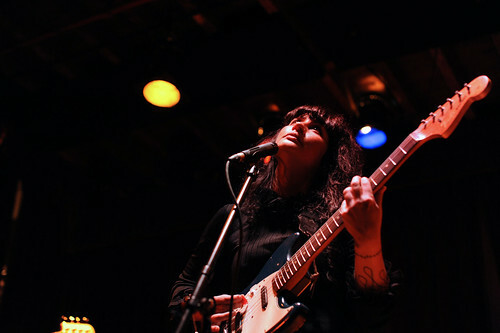 Frankie Rose‘s set for the Slumberland Anniversary show at Bell House two weeks ago was short and to the point. Frankie solo music continues along the same vein as her two prior bands, Vivian Girls and Crystal Stilts — that is to say its influenced by the 60’s garage sound. However, the all-female Frankie and the Outs present a more uniformed stage presence and have a decidedly Ronnie Spector sound. This was most evident in the re-arranged “Where Do You Run To”, a song Frankie wrote and originally recorded with the Vivian Girls, and in the new Slumberland single “Thee Only One”. At five songs and seventeen minutes, the set was a tease but certainly a nice taste of good things to come from this compelling artist. We recorded this set from the same spot as previous sets from this concert. The sound quality on this recording has a somewhat better mix than the others and we tweaked a little EQ to maximize the sound quality, which is now superb. Enjoy! 03 Where Do You Run To? If you email nyctaper for access to this recording, we expect that you will PLEASE SUPPORT Frankie Rose, visit her MySpace page, and purchase her new single “Thee Only One” from the Slumberland Records website [here]. thanks. brief but good. when will you be posting the crystal stilts set? I will be posting this night’s Crystal Stilts set together with their Halloween show in the next week.